I have been getting a lot of questions this week about the perceived large amount of white mold in soybeans in Wisconsin. There is more white mold out there than we predicted. 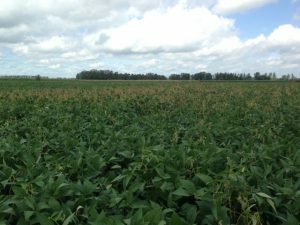 However, there is also some confusion out there on how all this white mold got there and how to interpret the amount of white mold as it relates to yield loss. Below is a great question I received today and will try to answer below. What is up with all this white mold? Here is my interpretation of what is going on, correct me if I’m wrong. White mold infection happens at R1, way back in June, but disease symptoms (flagging plants) show up in late July and August, correct? While the plant got infected in June, the weather needs to be right for the disease to grow – cool nights, warm days and wet conditions. As we go into August these conditions are more common and the disease appears to be spreading when actually it was already there it just needed the right weather to explode? Also I think we often over estimate the amount of infection, it just looks bad, but infection rates are not as high as we think. If we lose 2 to 5 bushels for every 10% increase by R7, that means if we have a 10% infection rate, we may lose a very small amount 2 bushel or more, maybe 5 bushels. Assuming 130,000 plants per acre, that would require 13,000 plants per acre to be infected, correct?. I’ll answer the easier part of the question first. Yes, everyone over-rates severity of white mold. Because it makes those bleached stems that look horrible, everyone estimates it much higher than it is. I had a person tell me that he had a field that was 60-70% white mold. I asked him, “you mean to tell me there are 6-7 plants out of every ten plants in that field infected?” He stopped a minute and then thought about his answer again. Our field crew has rated about 20 fields around the state, in addition to our research plots. In production fields incidence ranges from 0-30% with most in the 10% range. We make 25 stops in a field. We rate the plants in 1 meter for two rows at that stop. We count all the plants in that one meter to establish the stand number, and then count infected plants. We then take a severity index rating too. I try to encourage people to make random stops and count the stand and then infected plants and not try to visually estimate. As humans, we make everything worse – its habit. So yes, at 10% and a stand of 130,000 plants you would need to have 13,000 plants per acre showing symptoms before you can detect reliable yield loss. Sure, you might have sections and pockets where you will have white mold and high yield loss, while other sections of the field yield really well, offsetting that loss. So you need to look across the whole acre to get a good estimate. Now for the hard part. The data, ours included, show that you have to have apothecia during bloom for infections. Yes, some plant-plant touching can spread the pathogen, but our data suggest that this method is infrequent. In 2016, the weather during the major part of bloom was really too warm and our models suggested this. However, here is what I’m thinking happened based on our observations and what we know about the white mold fungus biology. First, we had above average rain. Frequent rains can cool the plant canopy and offset the ambient temperature. This fungus is super sensitive to temperature. More so than moisture. Our lab and other labs have done a lot of work on this and it always comes back to temperature that is most important for the white mold fungus. Also, because we had good growing conditions, rows closed quickly this year, giving us thick canopy even at R1; bloom often started early this year. A lot of our soybean varieties are indeterminate and can have an extended flowering period. This also doesn’t help our case. The longer that bloom lasts or flowers are present, the longer the crop is at risk for white mold. The weather has continued to be conducive now for apothecia. We continue to find apothecia right now (Mid-August) in our plots and my student is still trapping white mold fungus spores. This is unusual, but given that the canopy is thick and the weather is mild, not entirely surprising. If there are blooms out there, these spores are infecting. There is about a 10-14 day incubation period in the field. So fresh infections you are seeing now happened in early August. All of this just depends on when the crop bloomed and how long it bloomed for. So, late-planted soybeans with extended bloom periods probably got hit pretty hard. White mold is definitely heavier north of Arlington, Wisconsin. So I think having a slightly later planting and bloom period coincided with conducive temperature. There is a lot of white mold out there. Be diligent in trying to assess the damage. Don’t just visually estimate incidence. Actually make 10-20 stop per acre and count plants with white mold and also total stand at that stop. Convert the white mold numbers to percentage based on the stand count. The rule of thumb is that for every 10% increase in white mold incidence yield loss with range between 2 and 5 bushels.